The Raptor Trust is a result of one man’s long-time interest in nature and, particularly, birds of prey. Len Soucy first became interested in hawks after a visit to Hawk Mountain Sanctuary in Kempton, Pennsylvania, in the fall of 1964. From that time on he had a passionate concern for the well-being of raptors. His concern was well founded, for prior to the passage of the Federal Migratory Bird Treaty Act in 1972, there was no legal protection for hawks and owls. In the ecological “dark ages,” raptors (and most other predators) were viewed as vermin, bad and vicious killers, and they were regularly destroyed with impunity. Many states, including New Jersey, actually placed bounties on some birds of prey. And although there were many raptor advocates like Soucy, there were precious few people, and almost no facilities, that provided care to injured and orphaned predatory birds. 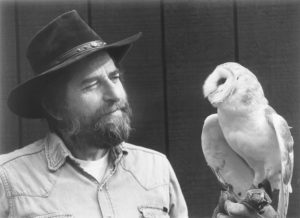 In 1968 Soucy bought a home on 14 acres of property in Millington, N.J.
With the help and support of his wife Diane and son Chris, he began to care for injured raptors, part time, in their backyard. At first the case load was small, but as their work became better known, the number of birds brought to their backyard bird hospital grew dramatically each year. By the end of the 1970’s hundreds of birds of all kinds, not just raptors, were being admitted annually. Aviaries were constantly being built and the facility expanded to house the burgeoning avian population. Throughout those years, all the work was done by the Soucys and a few dedicated volunteers. It was financed totally by Len and Diane. By the early 1980’s, the project had become so large and expensive that they could no longer afford to finance it alone. In 1982 the operation was named The Raptor Trust and established as a non-profit corporation in the state of New Jersey. The following year the Trust was granted tax-exempt status by the Internal Revenue Service. Funds could now be solicited and received from corporations, foundations and private donors to help meet financial needs.